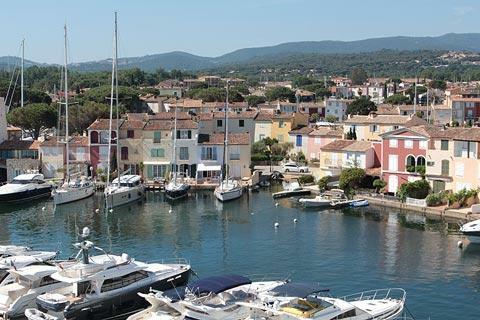 Port Grimaud is the sea-facing part of Grimaud, in a natural bay to the west of Saint-Tropez on the French riviera. 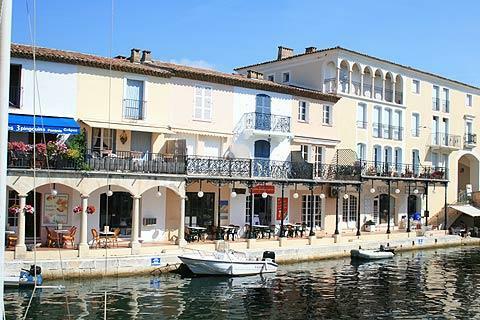 It is a water based village designed by Francois Spoerry, a famous 20th century architect, in 1966 in which the streets almost seem to emerge from the water. 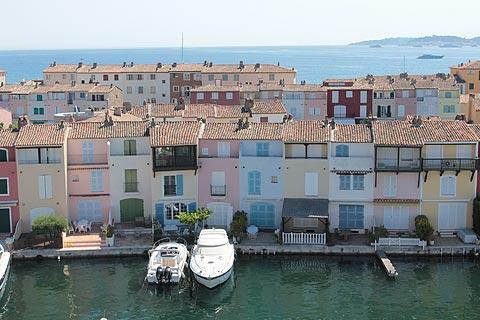 The town can only be accessed by boat or on foot. 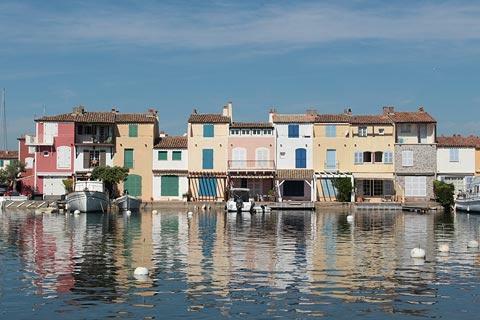 France This Way comment: if you have already visited several ports along the Riviera, perhaps at Nice, Cannes and Monaco, you might wonder why you should visit a small port such as Port Grimaud. 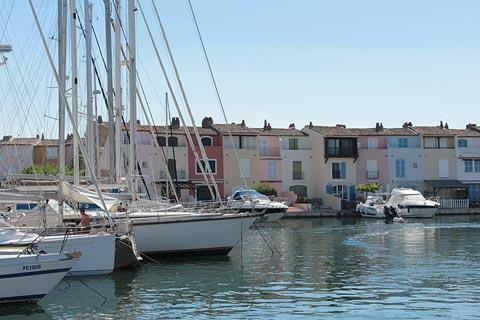 In fact it is completely different in character here, very charming, and there are no great yachts to admire but it is the architecture and the canals that is the main attraction. 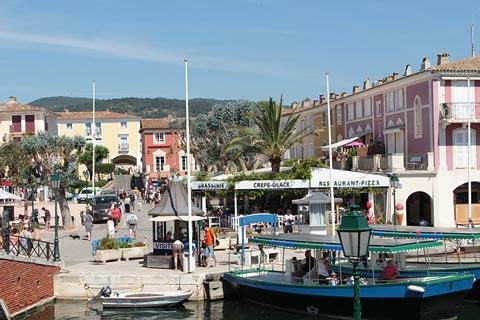 To enter Port Grimaud you have to leave your car at one of the car parks outside the port (quite expensive if you are at the beach car park) and enter the town through the guarded security gate! 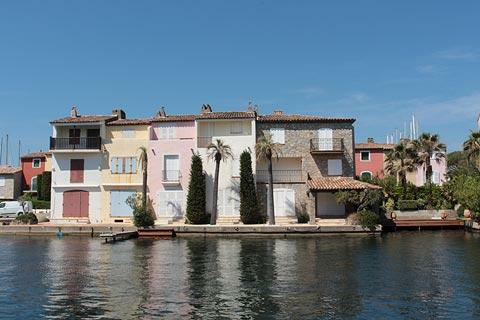 The houses in Port Grimaud are built in a very simple style, with the height and colour of the buildings being the main difference between them. The colours used for the houses are all terracottas, creams and dusky pinks, and some also feature wrought iron balconies. Several Venetian-style bridges cross the waterways, linking the different ‘streets’. The overall effect is very simple but quite beautiful and after the bustle of the rest of the Cote d’Azur it is extraordinarily quiet and peaceful here. 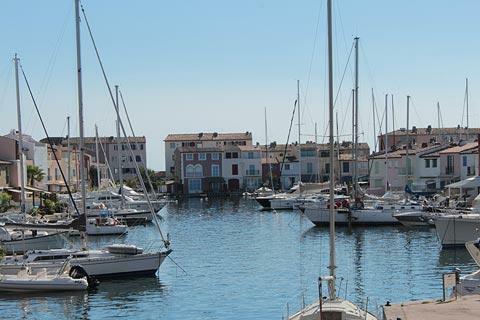 Although there are no large yachts moored here (these are just outside the port) there are lots of smaller boats and these add to the general attraction. 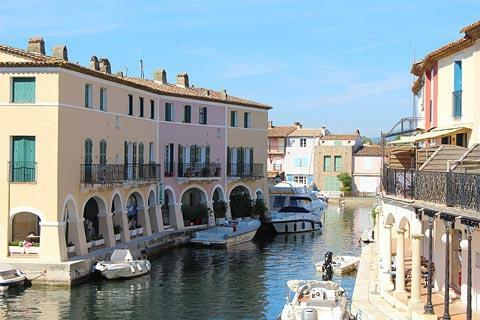 I think every town with a canal that I have visited in France tries to incorporate a comparison to Venice in its tourist information and Port Grimaud is no different: it is referred to as the Venice Provençale, and with more justification than some towns I have visited! 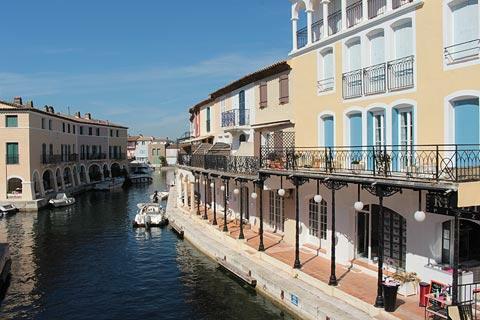 There are bars and restaurants on the edge of the water - a lovely setting for lunch or dinner - and a maze of arcades, especially around Place des Artisans and the Place du Marché. 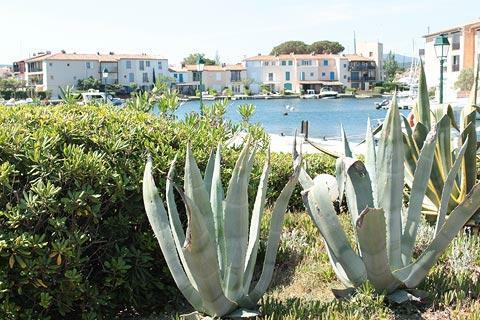 In all there are 12 kilometres of quays in Port Grimaud, but quite a lot is private and accessible to residents only. Houses are expensive here and include properties of celebrities such as Joan Collins. 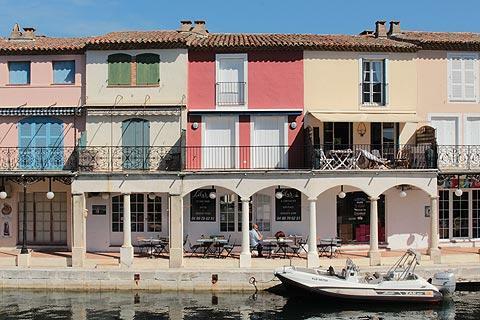 It is possible to take a boat trip to see much more of Port Grimaud than is accessible by foot. 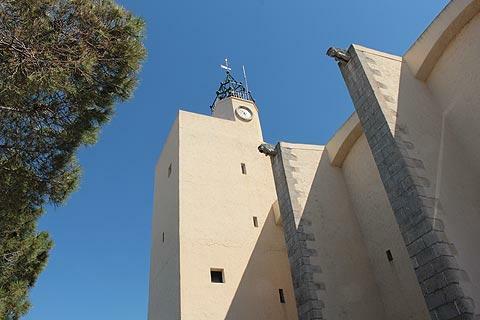 Another way to see the port is to climb the steps in the tower of the Church of Saint-Francis of Assisi. 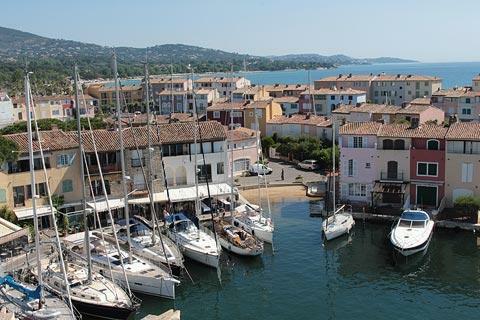 There is an admission charge of one euro, and from the top of the tower you have exceptional views across Port Grimaud, the gulf of Saint-Tropez and inland as far as Grimaud village. No one else visited while we were up the tower but I don't know why: it is one euro very well spent! 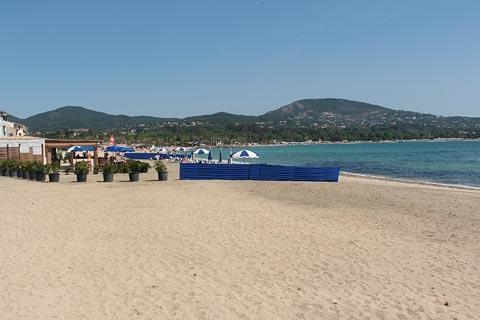 After exploring the port you can walk east along Rue du Septentrion from the Place des Artisans and then along Grand Rue to reach the beach: the plage de Port Grimaud is sandy and about 500 metres long. 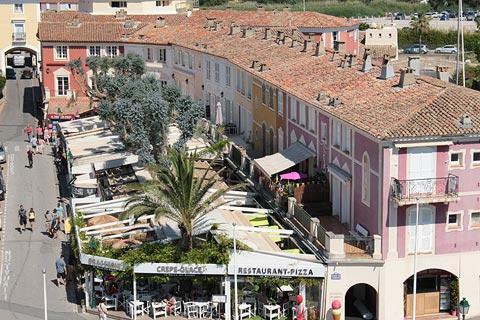 You will also want to visit the historic village of Grimaud while you are here: to avoid driving you can take the ‘Petit Train’ and get a scenic trip of the two villages. 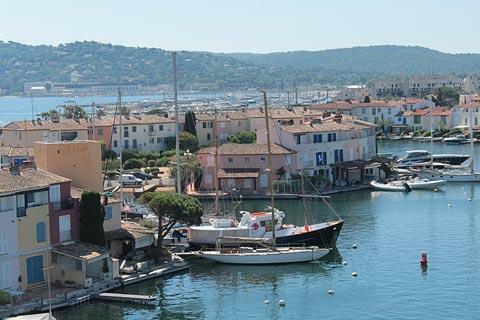 There is a great deal to see within a short distance of Port Grimaud, with our favourite highlights including Saint-Tropez on the coast and the villages of Ramatuelle and Gassin in the countryside behind the coast.